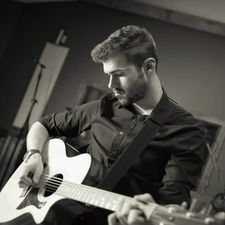 Ryan Quinn is a vocalist/multi-instrumentalist born and raised in Central New York. Growing up in a musical family, he was exposed to a wide variety of music at a young age, including: jazz, soul, funk, rock, fusion and acoustic/singer-songwriters. Before playing out in local bars and restaurants as a solo act, Ryan started his musical career as a drummer. However, after being accepted to SUNY Oneonta, his focus shifted to singing. Ryan had the opportunity to work with SpyroGyra founding member and Grammy-nominated Jazz pianist/composer Jeremy Wall for three years while attending SUNY Oneonta as the lead singer of the SUCO Funk Band. Wall played keyboards in the band, which performed songs by artists such as Stevie Wonder, Tower of Power, Otis Redding, and Marvin Gaye. Recently, Ryan began performing with family friend and guitarist Dave “Dinger” Wingfield, a Central New York legend. The duo plays an incredibly wide variety of material, spanning multiple decades and genres. The variety of music, along with Quinn’s four-octave vocal range and impressive control, Dinger’s beautifully placed guitar licks, and the finesse both musicians play with makes for a musically interesting, ever-changing, dynamic experience that people in Central New York are really starting to talk about. Currently, Ryan and Dinger are playing around Central New York and writing material for an upcoming EP release.